PearlMountain Technology Co. Ltd provides 20 number of licenses for CollageIt Pro. 12 CollageIt Pro license code for Windows version and 8 licenses for Mac version. I'll giving away all license for this blog readers. All both version this software will be granted to this PromonDeals.com readers. Normally, one user license for this software is priced at $29.90. CollageIt is easy tools to create photo collage easily. Actually there are free version for this software. The free version doesn't allow you to crop any image on your photo collage project. Just requires simple steps to create photo collage easily. This software designed for all lever user. You are novice or pro, can create photo collage in a minutes using this software. CollageIt can be installed on newest version Mac OS X and Windows operating system. Leave a comment on this post and write your reason why you need this software. Select the CollageIt version you want, Mac or Windows version. Its fast giveaway. After your comment approved the license will be sent to your email address. be make sure to use valid email. The giveway ended after all license code granted to this Blog reader. [Optional] share this post/blog on FB, Twitter or Google Plus. Designed for all lever user. Its come with simple interface. Fast and lightweight software. It just requires small computer resource. Provides real time preview. What you see is what you get. Visit official website at collageitfree.com to try the free version this software. Thanks to Candy (pearlmountainsoft.com)has provided 20 free licenses on this offer. 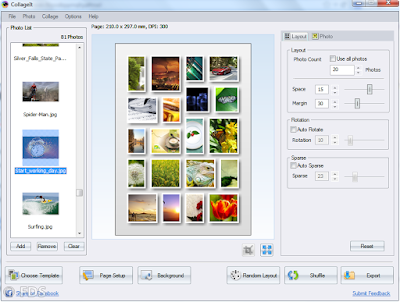 It's easy-to-use photo collage maker software that everyone will love it. I took a lot of digital photo and always look for free and great photo collage maker. I hope that i will receive the windows version. I take so many photos and love playing around with interesting software and CollageIt Pro for windows is the perfect giveaway for me. So please count me in for this amazing giveaway. Supercalifragilisticexpialidocious! I love making collages. This is great software do do it. Thanks! It's nice program to do various collages. I would like to try make collages with this program. I started make photos and collages are very interesting method to show many pictures. I am Windows user. thank you very much for this excellent giveaway CollageIt Pro is an amazing program I am very interested in it because I can make art with make my photos look great and beautiful always with amazing designs I would love to have a license of this great program windows version thanks and regards. Been looking for a more flexible Windows-based collage maker than Picasa. This looks very promising...thanks for having the giveaway! I want to use it as a personal home user. I liked the program. Its best photo college maker and easy to use! thank you for your generous offer ! i'd like to have a licensed copy of the windows version so i can prepare photo-collages for my group's newsletter. I have always wanted to try creating collages but can't afford to purchase a program only to find out it doesn't work a well a they say. Receiving a license to CollageIt Pro would be awesome. I need a Windows version for CollageIt Pro. Definitely Windows version in my case. Here's a tip for Windows Users.. get a software that increases your desktop windows size and you'll be able to have a type of zoom option for Collage Pro also with the right dimensions you can make your own Facebook Timeline covers that will look outstanding... Second tip you can make any clipart or photo as a mask just insert the image into the mask section (For me I've made on the regular version all the safe html color filters) simple tool with tons of options to have fun. I have some nice photos of my children and I wanted to print out a few collages. The program just in time. I need Windows version. Thanks for this giveaway. @all, Check the licence key in your email inbox. All CollageIt Pro license code windows version has been granted to this blog reader. Remaining, 8 licenses for Mac version. I want to make collages of my holiday pictures and other events. I need the Mac version. I need CollageIt software in windows version to collage all of my holiday or event photos automatically. Pleaseee I really need this cause i want to create a collage to my dad, i wanna give him a surprise and i need to crop some photos. Windows version. I am creating a memorial photo collage and would love to have the mac one! the software is real good. collages are easy to made! hope to get a licence code. many thanks for pc. Trying to collage my recent overseas trip into a poster. Would appreciate the licence code for mac. Thanks! I'd like to have a mac license. Thank you! Hi need a code to upgrade my app need to collage photos for my dad. can anyone help me pls. Collageit software is easy to use.. Trying to make a photo collage of my friends photo I hope to get a license code for windows. Thanks. Hi! My husband and I live abroad and create christmas card to send back home to friends and family.